This asinine wingnut fauxrage over a sand sculpturewouldn't be worth mentioning except the Deputy Comm. Dir. of the RNC promoted the ludicrous lie on twitter. The leading bleaters of the wingnut blogs are blithering idiotic about that arrogant blah guy, (who is still wrongfully occupying their White House dammit), erecting a sand monument to himself outside of the DNC. Of course, 30 seconds of research on this thing we like to call the internets would prove the state of South Carolina paid to have it built as a promotion for Myrtle Beach. The Obama sculpture doesn't look at all like Mt. 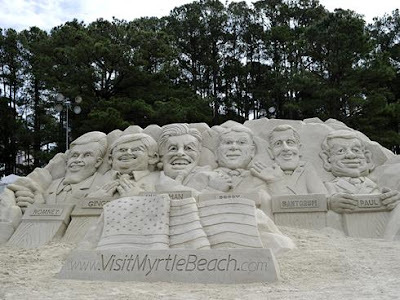 Rushmore either but this is not the first time Team Sandtastic built a tribute to politicians. You might remember the real Rushmore tribute to Republicans back when the 2012 GOP field was fondly referred to as the clown show. Apparently the mighty fightin' keyboardists of Outer Wingtopia would prefer to forget it. Can't blame them really and hell, you can't build a fauxrage on facts. On the bright side, it is cheering to think there are five guys in Florida who are making a decent living traveling around the world building castles made of sand. If that's not the American dream, it certainly is one of mine. Coolest occupation ever.